The man with the permanent frown is back. 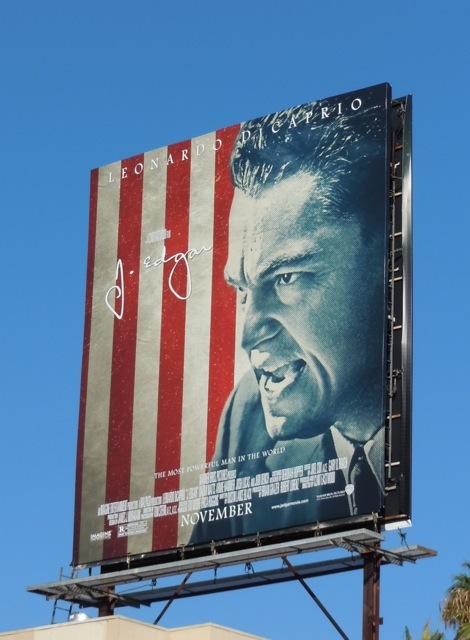 He worked his furrowed brow in Shutter Island and Inception, now Leonardo DiCaprio tries desperately to cement his place in acting history by playing 'J. 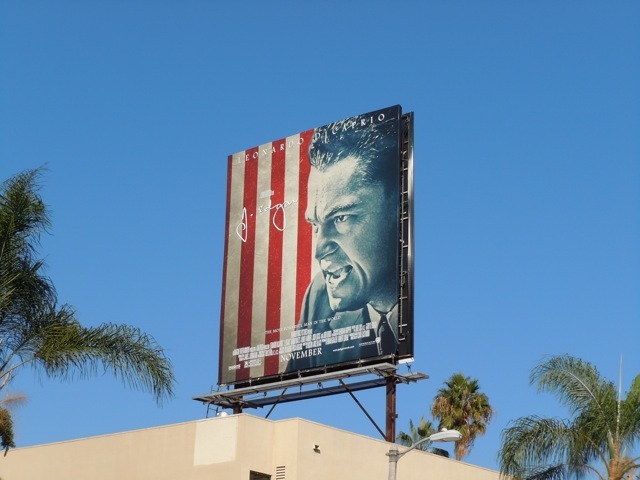 Edgar Hoover' in the latest movie directed by Clint Eastwood. 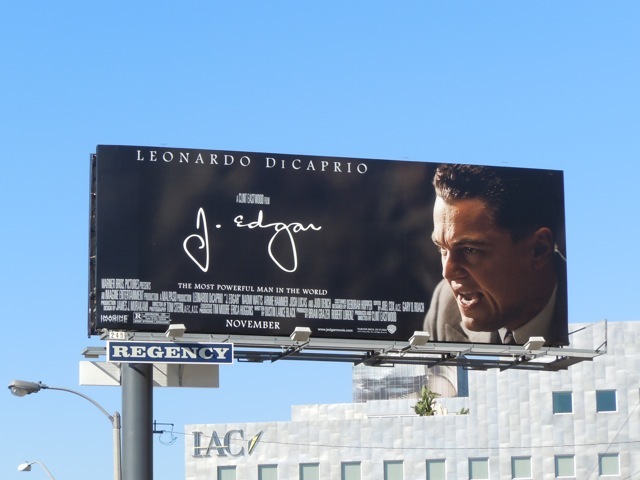 Regardless of what you think of the actor though, these billboards for the biographic film about the first Director of the F.B.I. really stand out with their patriotic American colours. 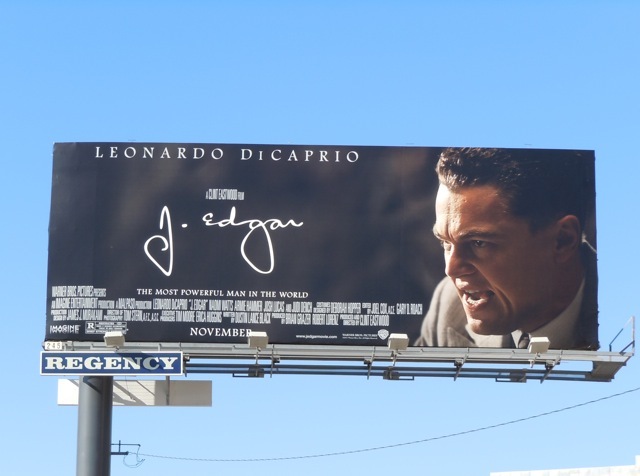 The atmospheric standard size billboard for this movie was snapped along Sunset Boulevard at Holloway Drive on October 8. 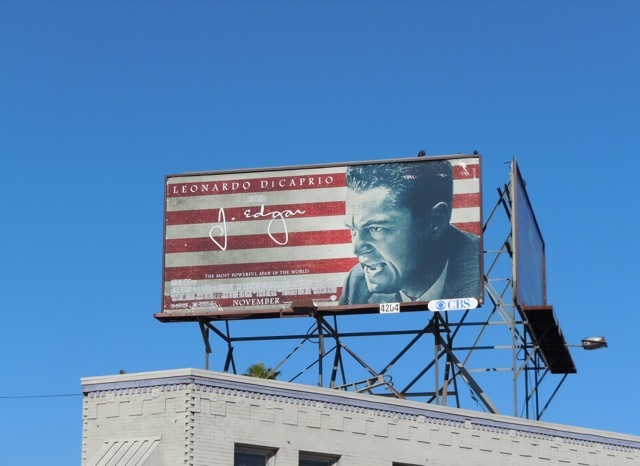 The squarer version evoking the Stars and Stripes flag appeared later and was snapped along Beverly Boulevard on October 18, whilst the smaller billboard was captured along Sunset Boulevard on October 27, 2011. Daily Billboard thinks it's an interesting touch that the stripes are reworked to be horizontal or vertical depending on the format. 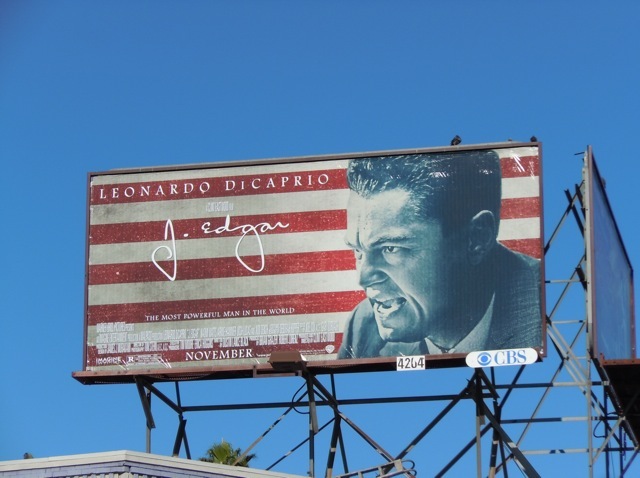 Be sure to also check out Leonardo DiCaprio's Shutter Island billboard and these Inception movie billboards. 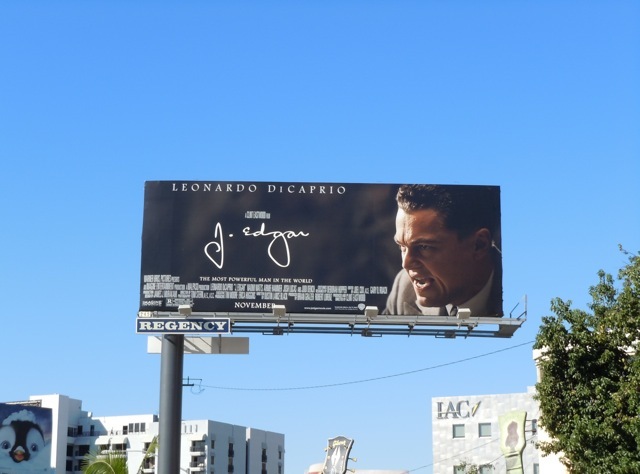 UPDATED: Daily Billboard also spied this super-sized billboard for J. Edgar gleaming in the East Coast sunshine on the November 7, 2011. 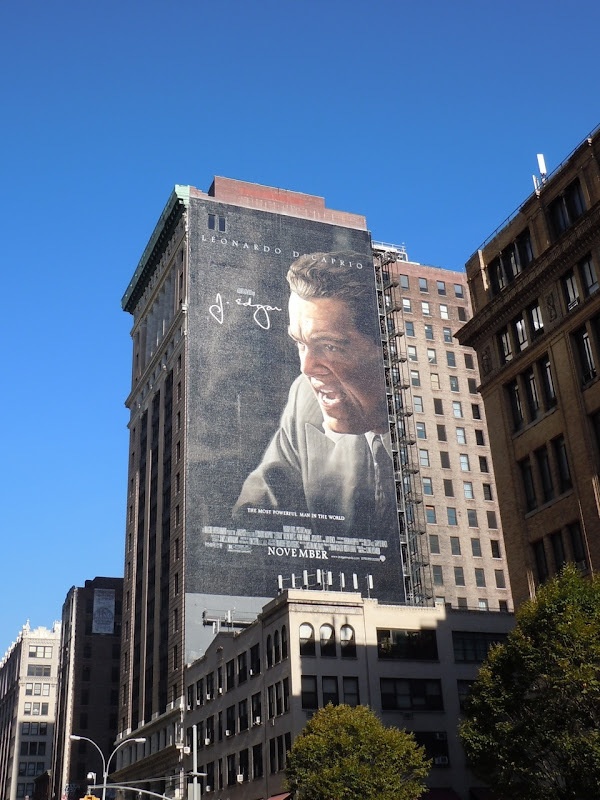 This giant creative was snapped along Manhattan's Park Avenue and 23rd Street in New York. 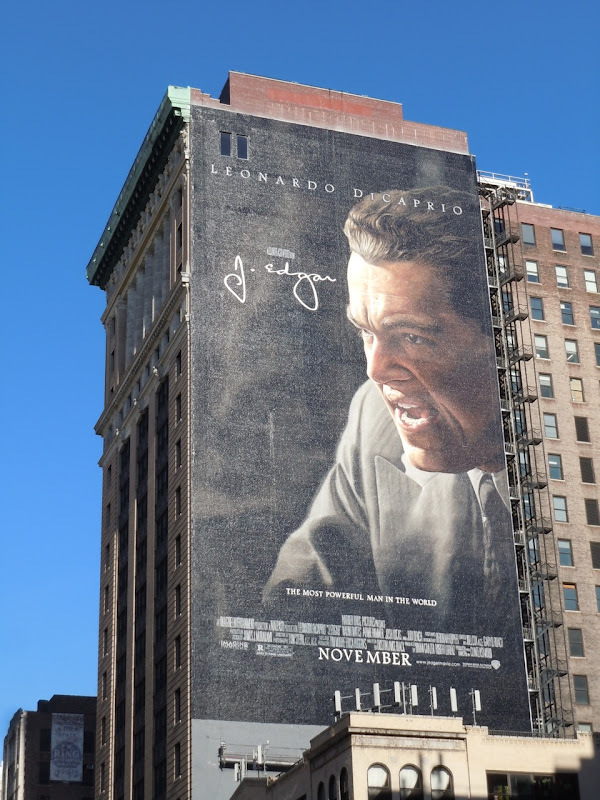 If you like this, be sure to also check out this giant billboard for The Dark Knight photographed in the same location from June 2008. Is it just me or is Leo starting to look like Tom Hanks?